On February 12, Representative Jan Schakowsky wrote Kathleen Fasanella to complain about the design of her websites and to attempt shame Kathleen by linking child deaths to the origins of the CPSIA. See http://designer-entrepreneurs.com/blog/illustrations/Letter_to_Kathleen_Fasanella.pdf and http://www.fashion-incubator.com/phpbb/viewtopic.php?t=4875. Incredibly, Ms. Schakowsky resorts to emotional manipulation and intimidation in response to the exercise of Kathleen's Constitutionally-guaranteed Freedom of Speech. I believe Freedom of Speech was once considered a sacred right in America. Perhaps the debate over the CPSIA has become too leaden for Ms. Schakowsky. Ms. Fasanella's answer to Ms. Schakowsky deserves your attention. See http://www.fashion-incubator.com/archive/my-response-to-representative-schakowsky/. Please read the 45+ comments as well. What is notable about this exchange of letters and the associated comments? Of course, the issue is "misinformation". There has been much traffic in accusations of "misinfomration". See http://energycommerce.house.gov/images/stories/Documents/PDF/Newsroom/nord%20moore%202009%201%2016.pdf and http://energycommerce.house.gov/Press_111/20090204/cpsc.pdf (Congressional leaders) and http://www.consumerfed.org/pdfs/CPSC_leadership_release_1-30-09.pdf (consumer groups). In Ms. Schakowsky's letter, she identifies herself as a major source of misinformation - all in the name of defending the noble CPSIA. Hmmm. How should we voters feel about this kind of manipulation by an elected leader closely identified with the CPSIA? I believe the public believes it can rely on our Congressional leaders to get it right, but that is apparently a misplaced trust. This is especially irksome since advocates for the CPSIA strenuously sling mud at unnamed opponents for trumpeting "misleading" information. The tactic of attacking the messenger in order to distract from an inconvenient or unwanted message is an old trick. We get it, and the press gets it. When will Congress? There is a large group of concerned citizens agitated over this law. You can read the comments yourself - how is public opinion running ? It may no longer be relevant how lopsidedly this bill passed - the public is getting fed up. Now that the CPSIA's destructive economic impact is finally being felt, public sentiment is running strongly against the new law. The notion that this law changes the safety picture has been exposed as a joke. Nevertheless, Congress persists in repeating its mantra that the law will not be changed and the CPSC simply needs to implement the CPSIA and make things "clear". Hearings on the law have been scheduled - and cancelled - more than once. This is transparency? Is this what we Americans voted for in the Obama "revolution"? I used to think safety was a non-partisan issue. . . . The longer that Congress arrogantly refuses to acknowledge the public with its legitimate concerns about this dangerous law, the more likely the outrage will turn into a political firestorm. The American public is increasingly disillusioned with the new Congress as the U.S. economy sinks into the abyss. It's time for Congress to acknowledge the serious errors underlying this terrible bill - publicly for the benefit of the American people - and to take serious action. Please do not underestimate those of us advocating against this bill. We will not agree to tweaks (the word "any" in the lead exemptions won't do it) - the bill needs to be reconsidered. I hope you will act before it's too late. Our small businesses, and your constituents, are waiting. I will be posting this letter to my blog. Please feel free to join the debate there for all to see. Follow my blog at http://www.learningresourcesinc.blogspot.com/ or at www.twitter.com/rwoldenberg. Please find attached my letter to Rep. Bobby Rush and Rep. George Radanovich on the Toxic Substances Control Act (TSCA) dated February 24, 2009. This letter was entered into the record of the February 26 hearings held by Rep. Rush's subcommittee on the revision or amendment of TSCA. The subcommittee is apparently considering changing the focus of TSCA into a precautionary law much like the EU's REACH. Interestingly, to change TSCA into a precautionary law would require overlooking the terrible example of the CPSIA, a blatantly precautionary law that avoids all concept of risk assessment. As Gib Mullan, Director of the Office of Compliance and Field Operations of the CPSC stated on February 26 at the ICPHSO Conference in Orlando, Florida (http://www.icphso.org/), "Congress made it clear that [the CPSC is] to get away from 'that kind of analysis'". Thus, the CPSC is a precautionary law in which the regulatory agency is prohibited from considering if there is ANY risk associated with banned or restricted products. This can cause severe problems, as I have pointed out in many previous letters. Please read the attached letter. Please amend the CPSIA urgently before it singlehandedly devastates the children's product industry, many tens of thousands of businesses. The economy is doing a good job of beating these companies to death - we don't need the CPSIA to finish the job. Compounding the problem in the view of the PTBs, we are apparently guilty of “misleading” our readers. I get the impression that it is because we all appear to be “hysterical” and “panicked”. [The proffered solution to our “emotional moments” is just to TRUST the CPSC and Congress. They know what’s best for us,, don't worry. I guess they must be the “Dads”. There, there, Mommies., Congress will protect you!] The beautiful part of this slam on our intelligence and integrity is that the accusation comes from Congress and from the consumer groups. Regarding Congress, I would simply note that Mr. Waxman has caused me to be uninvited to testify on the record THREE TIMES NOW. Aha, there’s a guy who’s out to set the record straight with open debate and dialogue. I guess I must have a “bad motive” in my opposition to his perfect law. Could there really be ANY other explanation?! Can't let the riffraff pollute the discussion, now can we? In the case of the consumer groups, it is clear that they are making considerable errors themselves (misleading accusations of travel abuse by Nancy Nord, distortions of actual testing costs, mischaracterization of the actual workings of the law and so on) but, hey, let’s not be too picky here because, DARNIT, they’re just looking after our own best interests!. Of course, Consumers Union say they fact check their blogs, which makes those blogs demonstrably better than anyone else's, especially a bunch of Mommies. No, we should all rely on those lily white and pure architects of society and while we're all it, the traditional media, well-known for being faultless. Ironically, in all the bashing, there are no actual examples of abuse or serious and misleading error, just a lot of hot air assertions. It must be nice to be able to just swing away with no accountability. I guess one doesn't have to fact check an accusation. . . . I will put my blog upside anyone else’s blog for accuracy. Please find my errors and send them to me, consumer group factcheckers. I stand ready to correct my many misleading errors. The tactic of marginalizing an unpopular or inconvenient message by attacking the messenger is an old trick. The way to beat this tactic is to expose it. Hey, supporters of the CPSIA, instead of maligning us, why not take us seriously and ANSWER US? If you're right, we'll be the first to admit it. Show some respect, however, and respond! Having had a few hours to mull the cancellation of the hearings on CPSIA by the Subcommittee on Regulations and Healthcare of the House Committee on Small Business, I conclude that we need to flex our muscles if we want to stay in the game. This shameful display of partisan politics (lest we call it some form of “religious” zeal) is a real demonstration of the tyranny that confronts us. It’s all the more shocking that it took place at the supposedly non-partisan House Committee on Small Business – they should be EMBARRASSED (shamed, really). To me, it’s impossible to deny that our voices are being INTENTIONALLY kept off the record, and worse still, powerful people are attempting to undermine YOU with slander and marginalization. We CANNOT allow this to go on. What we need to do is to start calling the offices of the Small Business Committee (202-225-4038, ask for Erik Lieberman and leave a message if necessary on his voicemail) to inquire about why the hearings on the CPSIA were cancelled. We should tell them that the law is killing our small businesses, that we cannot comply with it, that it’s too complex and unrelated to safety risks and needs to be changed. Tell them that this is not all about crafters and dirt bikes – it’s about American small businesses trying to survive in a Depression! The hearings were essential to air out these issues. Ask for a response. You should feel free to call more than once. Start with a call on Friday, and then call again next week. Get an answer. Make them listen to you. It turns out that you matter! You may also call other members of this Committee to express your dismay. You can see the committee list at http://www.house.gov/smbiz/democrats/members.htm. If you happen to live in the district of one of the members of the Committee or better yet, one of the Subcommittee members (http://www.house.gov/smbiz/democrats/subcommittees.htm), please scream even louder. We need to be heard, REALLY HEARD. You should get everyone at your company, everyone in your family, all your friends, customers, suppliers, neighbors, fraternity brothers, your minister and the guy who sells you stamps at the Post Office, to call about this issue. We need to BURN their phone lines over the CPSIA. We got this far by demanding to be heard, as a group. It’s time to turn on the jets and go harder now. Go get ‘em, let them hear your voice!!! I have just been advised that the hearings of the Subcommittee on Regulations and Healthcare (House Committee on Small Business) has been CANCELLED. This is the third time I have been invited and uninvited to testify before Congress. Mr. Waxman must be terrified to have me on the record. Say, Henry, what's up? Why are you afraid of me? Bob Adler of the University of North Carolina Business School and the Obama Transition Team (along with Pamela Gilbert) gave a keynote speech at the ICPHSO conference yesterday. Bob has been very influential in the development of this organization, and has strong ties with both the CPSC and consumer groups. He gave a fairly gloomy report. In his speech, he noted that the CPSIA was written in anger and that the Agency is in turmoil. The 42 deadlines in the new law are unworkable and won't be met, notwithstanding the hard work of the CPSC. It's an impossible task. He also acknowledged that important work of the agency is NOT reflected in the new law, meaning there are other key hazards left untouched (but perhaps overwhelmed) by the CPSIA. He projects intense scrutiny of the Agency (tinged with great skepticism) as it attempts to implement this law by both Congress and the media. Given the overreaching requirements of the law, he seems to doubt that they can meet expectations, or at least it will be quite difficult. He also forecasts another significant brain drain at the CPSC, which is not good for them or for us. When considering the impact of the new Chairman, he noted that not only must the new Chairman hit the ground running in his/her administration of the agency, but must also be a master of managing expectations on the Hill and with consumer groups. He specifically noted the importance of catering to Congressional staffers (in case you thought your elected officials were running the government). The new Chairman must be able to talk some of these folks into a more reasonable, realistic position. He indicated that he was aware of the problems implicit in the retroactive effect of the standards. Let's hope the new Chairman can do something about retroactivity QUICKLY. He finished his speech with a plug for Pamela Gilbert as new Chairman. Hi Guys, sorry I have been absent for a few days. Tradeshow season has me scrambling. In addition, there has been more than the usual disarray in the wake of the February 10 standard implementation. But I'm back, thanks for waiting. a. I am at the ICPHSO meeting this week as a panelist. See http://www.icphso.org/ for more information. This is a gathering of safety professionals, government officials, consumer groups and other interested individuals. Many of the usual suspects are here, and it promises to be a very productive and interesting couple days. Although we just got started today, there already has been news. Gib Mullan, the head of Enforcement at the CPSC, has just stated publicly the Agency's intention to change its policy on penalties. In the last year, the CPSC has imposed 19 penalties (Mullan). Allan Schoem in the same panel discussion noted that penalties have always been de-emphasized at the agency (he was Gib Mullan's predescessor), limited to perhaps 12 per year for cases deemed extreme by the staff. Gib indicated that this policy is changing. They now intend to impose many more penalties (small and medium-sized) in order to drive the "deterrent effect" downstream. Wow, this should be lots of fun. . . .
Of course, this is hardly a surprise to me. I have written about it in the past (call me paranoid). The powers granted to the agency under the CPSIA was intended to be used. The anger of Congress was clearly expressed, and the intention to shift to a punishment approach to regulation is the "new way". Bob Adler in the same panel discussion mentioned that psychologists at the UNC where he teaches have found that incentives are much more effective in inducing behavior change than penalties. Hmmm. Apparently Congress never read that study. A little selective in their sourcing of information, perhaps? There is a lot to worry about in this important shift. The cost of interacting with this agency is already HIGH. There will be significant legal fees, very significant costs for recalls, loss of business from damaged commercial reputation, and NOW big penalties. Many people, perhaps naively, represent themselves with the CPSC. This will be foolhardy in the future. It is worth noting how penalties are "negotiated" with the CPSC. If you don't want to pay, you certainly don't have to. If you choose to fight, all you need to do is litigate with the U.S. government. They own the big printing presses, in case you forgot. After you spend the amount of the penalty in legal fees (takes about five minutes), you may quickly come to your senses. So, you pay or you pay more. Recalls will be insant death for some companies. Now that's a heckuva of a deterrent, don't you think? Nothing like randomness in your life to give you focus. b. I am about to hire a firm to help represent our interests with the press and in government relations on the CPSIA. This is meant to help keep our issues alive. As we move away from February 10, and as the terrible costs of this law become burned in and unrecoverable, our ability to motivate Congress to save us will probably decline. There will be less left to rescue. We need to be ever more proactive in our continuing effort to fight, fight, fight this law. If you are interested in participating in this advocacy process or would be willing to help defray some of this expense, please contact me at rwoldenberg@learningresources.com. c. I have been invited to testify before the Subcommittee on Regulations and Healthcare of the House Committee on Small Business next Thursday. The purpose of this hearing is to explore Small Business issues related to the CPSIA. The Subcommittee is still looking for small businesses to testify. I know the TIA wants to find a Pennsylvania small business (please contact Carter Keithley or Ed Desmond at the TIA if you want to help out). If you are motivated to testify, you may want to reach out to the Subcommittee staff to volunteer, or if you have a Congressman on the Subcommittee, contact their Washington office urgently. This is a great opportunity to get on the record. One of the members of this Subcommittee, Rep. Bobby Bright, has already launched a (narrow) bill to amend the CPSIA. I hope we can score some points and raise the urgency of the debate - before it's too late. PLEASE don't give up. We are not lost, but have to double down our efforts and communications. I am still flogging away and hope you will stick with it, too. Is it just me (okay, it's probably just me), or are we being overwhelmed with critical information and rulings on a daily basis, to the point where it is impossible on a practical basis to even READ them? I have noticed my hours of operation becoming more and more odd (check out the hours that I post my blogs, keeping in mind that I live in Chicago and not by nature nocturnal) and as I attempt to keep abreast of developments (impossible) and do my day job (what day job? ), I fall further and further behind. As anyone who knows me will attest, I am able to manage a fairly robust workload - but this is simply ridiculous, especially if you consider the absolutely critical nature of the challenge. This has been on my mind increasingly in recent days as the deluge of releases from the CPSC cascade over my inbox. There are critical rules I have not read that directly affect our business and this effort. I am running out of hours. . . .
"In any case, 2009 promises to be a year of intense activity at the commission, as the CPSIA's demand for regulatory action far outpaces CPSC previous years' standards output. The new law will significantly affect the regulated community, and products available to consumers, in 2009 and in years to come. 'In the agency's history we've issued 35 or 40 final product safety rules--in a 30-year history,' CPSC Acting Chairman Nancy A. Nord told BNA. Before Congress took aim at product safety, there were 13 ongoing product safety rulemakings. The new law requires CPSC to promulgate about 40 rulemakings over the next several years. In 2009 alone, CPSC expects to work on close to two dozen rulemakings, a number that could increase, according to commission officials." I had a sense of this. . . .
As if Ms. Nord's observations about rulemaking were not alarming enough, she continues: “I cannot overstate the concern I feel about the agency's ability to implement this law--given our resource constraints--in a way that both advances safety and does not result in regulations that are not well thought through.” I share that concern. . . . I have long railed against the complexity of the CPSIA and the practical issues posed by the design of the law. The overload of simultaneous rulemaking processes is part of our practical disenfranchisement by the design of this law. The volume of events is so great that we cannot, as a practical matter, participate. For instance, I have not submitted a comment letter to the CPSC since the request for comments on penalties in mid-December. You can probably safely assume I want to submit comment letters in every rulemarking process under the CPSIA. By running so many rulemaking processes at once, I am excluded because I cannot keep up. This is a serious issue. In addition, consider the challenge of complying with this law. Before now, we had to concern ourselves with one "per se" violation of law (Lead-in-paint), plus a range of voluntary standards, and mainly, our "duty of care" to consumers. By "we", I refer to toy companies. Clothing companies, publishers and many other industries swept up in the CPSIA had no comparable standard to meet. In other words, for toymakers, there was ONE rule we were never to violate (l-i-p) and could administer the rest by common sense and a sense of consideration toward our valued customers. This system had several advantages: (a) it tended to align safety resources around "real" risks (actual risk of injury in proportion to the probability of injury), (b) it was simple and UNDERSTANDABLE (it was basically governed by common sense, not arbitrary rules that were unrelated to our real world experience) and (c) it was TEACHABLE. The latter point is quite important. Operating businesses have an ever-changing roster of employees/associates. We have new managers, line employees, quality folks, customer service reps, warehouse employees, purchasing assistants, you name it. Every time someone new joins us in one of several departments and numerous functions, we have to teach them how to administer our business, in this case from a safety perspective. In the old scheme, we had one "stop the presses" issue (l-i-p) and designed a quick response/quick notice process to address our duty of care responsibilities. We could teach this system pretty easily and effectively. A. It is incredibly complex and difficult to understand. Ask five people to explain how the law works, and see if there is even ONE point they agree on. Won't happen. This tells you how difficult the law is to understand. We call this "empirical evidence" - data from the real world. Consumer groups and legislators claim to have superior knowledge that allows them to understand the law "perfectly" but we mere mortals can't get it right. I admit it - in the real world, I GUARANTEE no one will completely understand this law, and therefore their failure to fully comply is ASSURED. Should keep the CPSC satisfyingly busy . . . .
B. It's infinitely more risky. Any violation of ANY provision (and there are a lot of provisions now) can be the subject of a recall. The recent releases from the CPSC suggest that they intend to exercise caution in allowing violative products to remain in the market - get ready for a big jump in recalls. This change in atmosphere won't exactly be free, either. And as noted, these violations can also result in criminal charges. I am on record for months that someone will be going to JAIL in our industry at some point. I don't know who (hope it's not me) but someone's going to the pokey under the law. Is that appropriate? I think not except under the most egregrious circumstances, sight unseen. With 51 CPSCs now (State Attorneys General definitely count), the odds of rationality prevailing are poor. C. The law has become detached from consideration of risk and thus no longer corresponds to common sense. To administer this law in the real world, we need to keep it simple (stupid). The real world is comprised of ordinary people, not just lawyers. Education levels vary, sophistication varies, knowledge varies. To produce a uniform safety performance, we need a simple message that our people can grasp without a law degree and months of intensive study. By designing a law that does not correspond to our everyday experiences and perception of risk, Congress has created a set of rules that can't be governed by common sense. Hello Congress, the world cannot manage arbitrary rules of this complexity. If you want to rule by arbitrary fiat, you need to limit your rules to just a few (ex. : lead-in-paint ONLY). Otherwise, your regulator construct won't work - in a world of real people, a tangle of complex rules will discourage compliant behavior by encouraging capitulation or scofflaw behavior (e.g., black markets). D. Finally, and most importantly, these laws are so complex that they cannot be taught. EVERYONE facing this law as a fact of life will admit this point. IF you can grasp how the law works, can you possibly teach it to your co-workers upon whom you depend? Can you create circumstances where you ACTUALLY believe your organization will be conforming to this maze of complicated and inconsistent rules, thus saving you from the risk of jail time? I, for one, am not there yet. With the changing face of the workplace, if you ever succeed to in teaching this complex and evolving set of rules (it seems to change every day right now), the know-how walks out the door every day. At what point do you give up? Has ANYONE in Congress considered this issue, even for a second??? Welcome to my world. I will (someday) riff on the economic incentives of such a regulatory scheme. It is making our business model obsolete, and I can prove it. I haven't given up on our business, please note, but this law makes the job of making it successful infinitely more difficult - for no particular benefit to anyone. Thanks, Congress! Okay, let's recap here: on Thursday, February 5, a District Court in the Southern District of New York decides in the NRDC case against the CPSC that the phthalates ban in the CPSIA is, in fact, retroactive in effect as of February 10, three business days later. This overrides the legal opinion of the General Counsel of the CPSC from two months prior. On Friday, February 6, the CPSC indicates in a press release that it will abide by the court ruling (it won't appeal the ruling) and therefore apply the phthalate retroactively as of February 10 to all inventory in the United States. Two days later, bingo, phthalates in children's products (for children up to 12 years old) are banned. Much clucking from self-satisfied consumer groups for their great work protecting consumers . . . .
Not that it matters, but is this fair? Essentially, ON TWO BUSINESS DAYS' NOTICE, the U.S. government imposed a retroactive ban on a broad class of merchandise brought into this country in compliance with law and which had not previously been the subject of product recalls or reported injuries. In fact, the scientific staff of the CPSC had previously rejected claims that phthalates were unsafe. What's the precedence for this kind of thing? Notably, the 18th Amendment, the ONLY Amendment to the U.S. Constitution to be repealed, gave a one-year grace period to sell off inventory. This grace period was designed to cushion the blow to the liquor industry. It is worth considering that the campaign for the ban on alcohol was brewing for NEARLY 100 YEARS in the United States. Even the process of ratifying the 18th Amendment took 13 months from passage by Congress to its certification of ratification by the States. Implementation took place another 12 months later. All this for a consumable food product that was the subject of a prominent, national movement linked with obvious moral problems. The Volstead Act which created the enforcement mechanism for the Federal government, took effect immediately on October 28, 1919 (after Congress overrode the President's veto), in advance of the effectiveness of the 18th Amendment. See http://www.answers.com/topic/national-prohibition-act-1919. In the current mania, apparently our Congress has decided that the phthalate "crisis" is SO urgent that they have endorsed a scheme far tougher and much less sensitive to industry than even the Congress that approved the ill-fated 18th Amendment and infamous Volstead Act. With the outcome in the NRDC case, the advance warning provided to industry on phthalates can now be measured in HOURS. It is worth noting that this ban is based on asserted "links" to various health issues. There is considerable scientific debate over these "links" which many people think are not proven. Whether or not the "links" are real, it is abundantly clear that there is nowhere near universal agreement that this is a national health crisis. It goes without saying that the application of the ban on all products intended for children up to 12 years of age far outstrips the target zone of babies and toddlers who are known to mouth toys and other objects. Is it appropriate to impose such massive losses on industry in the face of such a fuzzy threat that is not universally accepted? In a self-justifying environment of legislators who congratulate themselves for "protecting children" without comparing cost (certain) and benefit (quite uncertain and tentative), it is not just business interests that are being disenfranchised. Let's not forget that all those businesses have customers (you) who need or value their products and services. The notion that this law only adversely affects a limited group of Americans or businesses is, in my opinion, loopy. This affects us all, and will deprive us of diversity of products and vitality in our local economies. Is it time to tell your government that you have had enough - and will remember them and their actions when you next step into the voting booth? Tell Congress how you feel - before they bankrupt your business. Tomorrow is February 10, effectiveness day for the new lead and phthalates standards and obligations under the dreaded CPSIA. Yes, the boom is lowered on Tuesday, and many of you are already taking dramatic steps to stay ahead of this law. With two days warning, the pain will be especially harsh on everyone with ANY phthalates exposure. Any inventory with phthalates that falls within the incredibly broad definition of a children's product becomes worthless at midnight (less than two hours from now, in Chicago), which will lead to huge business losses and possible loan defaults. Intentional or "knowing" violations of any of the many provisions of the new law exposes you to possible criminal liability, not to mention penalties and the pain and humiliation of recalls. Are we having fun yet??? We need to know what you are doing, how your business is being affected, how much money is being wasted, jobs being terminated, customer relationships ending and so on. We need to draw attention to these real situations and use the media to help explain the real world impact of this law. Congress wants to say that the disaster we were all predicting was just a figment of our imagination. Right now, they are sweating this one out. Let's bring reality to their doorstep. Please post your story as a comment on this post. Alternatively, or in addition, please email me at rwoldenberg@learningresources.com. Thanks. Here's a couple short articles for you. The first is by Howie at Live and Learn. The second is by Barbara Hester. Congratulations to both of you, great job! News Flash -- Congress Responds to Peanut Salmonella Scare with CPSOA Law. In response to the current peanut scare, there is a committee in Congress silently drafting the CPSOA - Consumer Peanut Safety Overkill Act. Key components of the act state that all food products must be certified that they do not contain salmonella prior to sale. This act covers all food items including those that do not contain peanuts or any peanut byproduct, including fruits, vegetables, meats, dairy products, natural foods, processed foods and packaged foods. "Food" is being defined as any product placed in a person's mouth and swallowed. Therefore, due to the broad definition as defined in the CPSOA, "food" is being defined to include items that normally do not contain salmonella such as beverages (alcoholic and nonalcoholic), chewing gum, hard candy, and all medicines taken by mouth. The commission will look into granting exemptions for certain products within one year after the Act goes into effect, but until that time all food items, as defined by the CPSOA, must be removed from supermarket, pharmacy and other retail shelves plus farmer markets, farms, slaughter houses, processing plants, warehouses and any other place the products may be found unless the product has been tested to prove there are no traces of salmonella. Kris Kringle (aka Santa Claus) issued a statement today expressing his sadness and disappointment regarding the new CPSIA regulations effective February 10, 2009. “I know I am a miracle worker, but even Santa cannot comply with this law. It will be virtually impossible to obtain test reports for the millions of toys our workshop manufactures each year. Besides the enormous cost for testing, certified labs are over 1,000 miles away. We do not have enough reindeer on staff to make the journey to deliver the samples, and UPS is just too expensive”. Santa has been working with the law firm Elfman and Snow since August, pouring over the details of the legislation. “This law just doesn’t make any sense!”. Santa's main distribution center is a sight to behold. At 4,000,000 square feet (370,000 m2), it's one of the world's largest facilities. A real-time warehouse management system is of course required to run such a complex. The WMS and transportation system are fully integrated, allowing the elves to make optimal decisions that balance transportation and order picking and other DC costs. Unbeknownst to many, Santa actually has to use many sleighs and drivers to get the job done Christmas Eve, and the TMS optimally builds thousands of consolidated sacks that maximize cube utilization and minimize total air miles. Unfortunately, this facility that employs thousands of workers will be closing on February 10. “We have tried unsuccessfully to reach out to the American Congress for relief, they just won’t listen. Today, it is with great regret that I am announcing Christmas is officially cancelled”. I thought you might be interested in learning of the effect of your CPSIA on the Mollison family discussed in my January 10 email entitled "The Emperor Has No Clothes". In that email, I discussed the sad situation of Raven Mollison and her mother Denise in Hawaii. Ms. Mollison feared having to close down her store because of the dramatic impact of the CPSIA on her business, and in the process, causing great concern to her daughter over their family's ability to pay for her medical treatments. Like so many others, Ms. Mollison was responding to the economic incentives in the CPSIA to discontinue important but harmless entrepreneurial activities; in this case; she closed her store rather take the risk of violating the new law. See http://www.khnl.com/Global/story.asp?S=9799062&nav=menu55_2, also reproduced below. We can only hope a black market will develop in her dolls to help Ms. Mollison pay her bills. Yes, a black market in America - what a lovely innovation caused by the CPSIA! KAILUA (KHNL) - Some possible relief for those who sell children's products, from toys to clothes. The U.S. Consumer Product Safety Commission (CPSC) has issued a temporary stay on the controversial anti-lead law that takes effect February 10. But, even with the stay, a doll shop on the Windward side of Oahu says it will still be forced to close. In Kailua, little Raven Mollison holds what's left of her mom's at-home business. "It's the last doll that my mom made so she gave it to me," she said. Her mom Denise, ran a doll shop to pay for Raven's medical supplies. The eight-year-old has Russell Silver Syndrome, which stunts her growth. "I'm very sad that she's shut it down out of business," said Raven. But Denise says she has no choice. A new anti-lead law calls for safety tests she can't afford. "Parents and consumers are hesitant to purchase my products and truthfully I don't blame them. If I could provide the certification then everything would be fine but my hands are tied," said Mollison. In response to critics who call the law a job-killer, CPSC has issued a stay of enforcement which puts testing requirements on hold for a year until it can work out a compromise. But business owners must still abide by the new lead limits. "The snag here is they're saying 'don't test but follow the guidelines'. You can't be sure you're following the guidelines unless you test so it's a catch 22," said Mollison. For Raven's sake, Denise is launching a new business. "My only life raft is making wristlets until this mess is resolved," Denise said. "It's very important so then I can get feeding more, so then I can grow," said Raven. On Thursday, U.S. Senator Jim DeMint introduced a bill to reform the law, saying "Congress has overreacted and threatened to kill thousands of jobs, small businesses and harm charities around the country. We simply cannot allow this law to go unreformed." DeMint's reforms would allow small businesses to use certification from suppliers and manufacturers. That way people like Mollison won't have to shoulder the costs of testing. Congress passed the Consumer Products Safety Improvement Act of 2008 last Fall after a lead paint scare in children's toys made in China. The act bans children's items containing more than 600 parts per million total lead. Businesses that sell used children's items, such as thrift stores, are not required to test their products. But they cannot resell them if they exceed the lead limit. 1. There is no reason for ANYONE to suspect that this doll store has EVER harmed anyone in any way. Can anyone provide ANY data to suggest that this store's products will harm anyone because of lead? No, absolutely not. I am fully confident that we can all agree that these dolls are highly unlikely to be harmful because of lead. So what have we accomplished? 2. Recognizing that these products could not realistically have any lead safety issues, the requirements of the law are extremely wasteful in this case, and are so serious that they threaten the very existence of the store and its products. [Notably, although the press is only focusing on the cost of testing, the list of problems caused for this doll store does not end there (not discussed in the video or in this email).] So what have we accomplished? 3. The diversion of capital and human resources to wasteful activities like excessive and almost neurotic testing prevents all kinds of alternative, productive uses of the financial and human capital being wasted. So what we have accomplished? 4. Given that the products and services of this store are useful and its profits are also deployed usefully in society (see the video), and further that as a direct result of the CPSIA the store will have to close, what have we accomplished? The story of this doll store is TYPICAL of the ill effects of this law. Don't be distracted by the particulars of this person's story - she stands for everyone similarly victimized by the CPSIA. The storyline may change but the story remains the same - there is a societal recognition that American products are safe. The idea that our economy is "full" of unsafe children's products is fed by fear mongering, not facts. The CPSIA with its excessive "zero tolerance" approach neither contributes to additional safety (whatever that means) or to the efficient functioning of the economy. The day of reckoning is coming, and these cries for help are being ignored. Something must be done . . . . So I am here to announce, for the first time, that the EMPEROR HAS NO CLOTHES. The CPSIA has nothing to do with safety - it is about vengeance, retribution and displaced anger. The discussion about safety under this law has become abstract and spiritual in nature, as though "safety" were a state of mind or some kind of karma level. That's not how the real world works - safety relates to RISK and risk can and needs to be defined. By drafting the CPSIA in such an absurdly overly-broad manner, Congress has created the conditions for debates like whether this little doll shop makes lead-laden dolls. I find it hard to dignify such debates by taking them seriously, as the notion that the subject dolls are somehow a safety risk is patently absurd, as is obvious to anyone living in the real world filled with real products and real risks. How did this happen? The Emperor's new set of invisible clothes were borne of anger from "43 million toys recalled in 2007". [See http://www.todaysthv.com/news/local/story.aspx?storyid=78263.] What exactly happened in 2007? The lead-related recalls related to LEAD-IN-PAINT, not lead in substrates. [In addition, there was one tort involving one piece of lead jewelry.] Lead-in-paint has been illegal for decades. I hate to be a killjoy, but this means that the problem in 2007 was compliance with law, not the strictness of the rules. This is a behavioral issue, not a restrictions issue, and requires a thoughtful solution tailored to the nature of the problem (lack of compliance). By extending the law well beyond the known safety issue (lead-in-paint) to a laundry list of imaginary risks not associated with actual injuries, we end up arguing about whether cloth dolls, culturally-authentic clothing, microscope bulbs and Harry Potter books present a lead danger. If we are going to pay to prevent safety "risks" of that microscopic magnitude, why stop there? If children's products up to age 12 are such a serious (and undefined) lead safety issue, why aren't dog toys? Why aren't products for adults? What about industrial products? What about products we put on spaceships? And, no, the CPSC cannot clothe the naked Emperor. It's simply not workable to write an ultra-complex law no one understands and then instruct a federal agency to just go "fix it". Even if that were possible, if a magical set of rules could be written that would fix the law so that all these various unthreatening situations could be addressed one-by-one (shoemakers, doll stores, t-shirt vendors, the needs of stores with less than five employees, blah blah blah), we would be left with such a vast crazy quilt of FAQs, interpretations, legal opinions, rules and regulations that compliance would become only a theoretical possibility. Again, don't blame the CPSC for the state of the implementing rules - until you try to write them yourself. Even the tax code makes more sense than this. The Emperor Has No Clothes - the CPSIA's gotta go. We can have plenty of "safety" without such a vindictive and overly-broad law on the books. I hope you will invite industry to help you urgently draft this new law, one to protect American children and the American economy appropriately for our lasting communal benefit. Have you read the statements of Commissioners coming out of the CPSC lately? The statements of Commissioners Nancy Nord and Thomas Moore of the CPSC given after the rejection of the NAM petition for a stay of the new lead standards under the CPSIA (https://mail.learningresources.com/exchweb/bin/redir.asp?URL=http://cpsc.gov/library/foia/ballot/ballot09/nam.pdf), as well as their statements given in support of the new interim final rule exempting certain items from the lead standards (https://mail.learningresources.com/exchweb/bin/redir.asp?URL=http://cpsc.gov/library/foia/ballot/ballot09/101lead.pdf) are very revealing. Rejection of the NAM Petition. As my recent letters confirm, the NAM petition decision was a foregone conclusion, as the CPSC is prohibited under Sections 101(b)(1) and 101(e) of the CPSIA from changing the new standards in any way for any product. Thus, the CPSC was legally prohibited from staying the new lead standards and the Commissioners made the legally proper decision to vote down the petition under your CPSIA. Interestingly, as another of my recent letters notes, after Acting Chairman Nord made this very point in writing to Representative Waxman et. al. in her letter of January 30, those House and Senate leaders responded on February 3 by demanding that she resign. Some great open dialogue there! The NAM petition, it should be noted, focused on the retroactive CPSIA lead standards because the NAM letter preceded the NRDC phthalates case decision last Thursday. Presumably, had NAM known that the phthalates ban would become retroactive instantaneously two business days before its February 10 effective date; their request would have included a stay request on the phthalates ban, too. Alas, we cannot wind back the clock, so the Commissioners did not consider this issue. They would have been legally prohibited from taking any action on the phthalates standard, of course, but the Commissioners would have been free to comment on it. In the below discussion, I believe you can safely read between the lines and infer parallel references to phthalates in the Commissioners discussion of the issues. The statements of Nord and Moore are quite informative. After reiterating the fact that the Commission is prohibited from staying the lead standard, Ms. Nord notes: "Rather than applying the lead content provision to products manufactured after the effective date, Congress applied it to all products out in the stream of commerce on February 10, sitting in container ships, in warehouses, and on store shelves. CONGRESS HAS NEVER BEFORE ENACTED SUCH A SWEEPING CONSUMER PRODUCT PROVISION IN A RETROACTIVE MANNER AND THE DISRUPTIVE RESULTS OF THIS PROVISION ARE NOW BEING SEEN IN PAINFUL WAYS." [Emphasis added] Of course, Ms. Nord overlooks the Prohibition as a precedent for this dramatic legislative overreaction. Ms. Nord goes on to note several impacts on trade, including removal of product from store shelves out of fear, disrupted buying by retailers and the prospect of widespread loan defaults. All old news, if you read my emails. Importantly, Ms. Nord states in conclusion: "CONGRESS SPOKE CLEARLY IN SETTING OUT A REGULATORY REGIME THAT APPLIES TO ALL CHILDREN'S PRODUCTS IN COMMERCE REGARDLESS OF EXPOSURE TO ACTUAL RISK. CONGRESS SPOKE CLEARLY ABOUT THE LIMITED NATURE OF THE EXCLUSIONS AND EXEMPTIONS AVAILABLE UNDER THE LAW. CONGRESS SPOKE CLEARLY ABOUT THE LIMITED NATURE OF OUR ENFORCEMENT DISCRETION AFTER FEBRUARY 10. THE AGENCY CANNOT AMEND OR CHANGE THE STATUTE." [Emphasis added] Happy days, indeed. Commissioner Moore takes a different tack when discussing the NAM petition. After reciting various administrative activities of the Commission relating to lead over the years, he attacks the integrity of the business community: "It would have been hard for a manufacturer of children's products to miss the clear message that they needed to get the lead out of children's products well in advance of final congressional action." It’s always helpful to have a “bad guy” to bash. Other than the fact that lead poisoning is virtually unknown in children's products outside of lead-in-paint (illegal for decades) and that the CPSC has always administered safety matters by examining the actual quantifiable risks, Mr. Moore might be right. However, responsible businesspeople concentrate on real consumer risks, and have no reason to concern themselves with the ebb and flow of possible arbitrary movements in the nation's regulatory scheme. Until recently, safety administration in this country was rational – is it really “foreseeable” that the legal standard would detach itself from risk so profoundly? In truth, periodic CPSC administrative activity over many years in relation to very specific circumstances is hardly a damning fact pattern revealing a dim-witted, oblivious or pernicious business community. Further rationalizing his condemnation of protests against the CPSIA, Commissioner Moore states his belief that "certain Hill staffers were assured by various segments of the children's product industry, that there would NOT BE A PROBLEM with meeting the 600ppm standard as most already were." [Emphasis added.] What a wonderfully open and accountable process Mr. Moore recites. It's a shame that Commissioner Moore chose not to attach names, dates or written testimony to such hazy assertions. In any event, it’s really not the standard itself that is the business community issue, but instead the breadth of the definition of products subject to the standard and the costs associated with PROVING COMPLIANCE with the standard and otherwise complying with the law. Mr. Moore clarifies that "[t]his does not mean I am not sympathetic to resellers and home crafters who are trying to figure out how to comply." Mr. Moore gives the impression that he believes opposition to this law comes only from marginal groups of unsophisticated people. In fact, the businesses impacted by the CPSIA are big and are small, and span industries like footwear, apparel, publishing, thrift stores, online marketplaces like eBay, toys, housewares, school supplies, furniture, bicycles, office supplies, sports equipment, novelties, incentives - and yes, crafters. Notably, this wide group of businesses certainly understands business law as a general matter. The law speaks for itself, and we have read it. Interim Final Rule Exempting Certain Electronics Items. In her statement on this decision, Ms. Nord notes that the hurry-up process used to issue the complex policy Congress demanded was driven by the agency’s inability to stay the lead standards: “This is not a procedure that I anticipate the agency will use in the future, except under the most demanding circumstances.” Could something important have been missed? Apparently Congress only wants true, peer-reviewed science utilized when opponents attack its bill. Interestingly, Ms. Nord also notes that the CPSC no longer controls how safety is policed in the United States because there are now 50 shadow CPSC’s to dog the business community: “I also HOPE the state attorneys general will follow our lead and adopt similar enforcement policies.” [Emphasis added.] In our business, we say “hope is not a strategy”. I take little comfort in Ms. Nord’s plea. Commissioner Moore adopts a more conciliatory posture in his statement, as though we might not have read his other attacks on business: “The Commission will take a measured, reasonable approach to administering the new law. We will be patient with businesses working to come into compliance . . . .” I would note that every communication that the CPSC has put out in recent weeks has asserted the importance and inflexibility of the new standards, including the need to self-report for seemingly any known violation. Does this mean that the CPSC won’t force recalls for these self-reported violations? That seems contrary to everything I have read from the CPSC and Congress lately. I take cold comfort in Commissioner Moore’s soothing words – the CPSC’s stated policies are otherwise. He goes on: “We have always focused on protecting the consumer over penalizing the inadvertent missteps of small businesses. I see no reason for that approach to change under the new laws . . . .” This might be true (I certainly hope so), except that now the safety rules are absolute and the agency has little discretion left in its administration of these rules, so whether missteps are “inadvertent” won’t matter AS A MATTER OF LAW. Furthermore, the range of legal requirements has spiraled out of control, leaving the task of compliance beyond the capability of 99% of all companies (in the real world). There will be plenty of missteps to review and consider. The concerns of the business community are legitimate and are URGENT. You MUST take action right now to stay this "awful law" (see WSJ Editorial dated February 6 https://mail.learningresources.com/exchweb/bin/redir.asp?URL=http://online.wsj.com/article/SB123388626627155299.html). 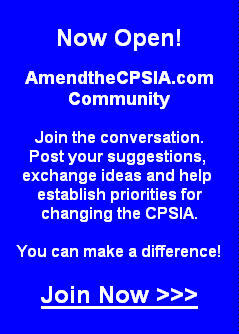 You have been notified AGAIN AND AGAIN about the many problems created by the carefully crafted language of the CPSIA. The financial consequences to many businesses will begin to become apparent in just a few short days without your action. Whether you agree or disagree with my position, sufficient doubt has been created to merit “hitting the pause button” allowing for further hearings and open discussion of the impact of this law. The public health “crisis” is imaginary and does not justify the horrifying risks you are taking with the U.S. economy. Yesterday, two events took place that ensure the devastation of many American businesses, namely the decision by Judge Paul Gardephe of the U.S. District Court for the Southern District of New York (08 Civ. 10507 PGG) to overturn the legal opinion of Cheryl Falvey and establish a virtually immediate retroactive nationwide ban on phthalates on February 10 (the NRDC Case), and the rejection of the National Association of Manufacturers’ petition to stay the new lead standards by a vote of the CPSC Commissioners 2-0. While the latter outcome was expected (see the legal analysis in my email dated February 4 entitled “CPSIA – The Blame Game”), the NRDC Case decision was unexpected and is a huge setback to any rational implementation of this law. The decision raises anew the prospect of a National Bankruptcy Day on February 10. On November 7, I wrote an email to Cheryl Falvey, General Counsel of the CPSC, documenting the potential of her retroactivity opinion (on lead) to cause widespread loan defaults among American businesses. I have reproduced the November 7 email below and in an attachment. My warnings of dire consequences from the lead ban have been ignored, but courtesy of the NRDC Case, we will soon find out if I was right. With two business days to go, and no advance warning, American retailers and manufacturers will be caught with massive inventories of product which they had been assured was legal to sell (opinion of Cheryl Falvey dated November 17, 2008) but which will now become contraband on February 10. The ability of such companies to comply with their asset-based loan agreements is now in question. Likewise, the decision in the NRDC case creates an overnight Sarbanes-Oxley disaster for the SEC as countless public financial statements instantaneously become materially misstated. It will be most interesting to see how the banks respond to this Congressionally-induced crisis. I am cc’g this email to Jamie Dimon, the CEO of JPMorgan Chase, whose loan documents are abstracted in the attachment, so the bank can begin to review its options. Another financial crisis for American banks, how exciting for the American public! The response to this letter was swift – by letter dated February 3, Representative Waxman et. al. requested that President Obama urgently replace Ms. Nord. Thus it appears that silencing Commissioner Nord is the preferred response to her comments on the inner workings of the CPSIA. The Congressional leadership’s intolerance of dissent is outrageous. As stated in Representative Waxman et. al. state in their February 4 letter (see attached), “everyone agrees” that the new standards are “critical” to protect children. See no evil, hear no evil . . . . The substance of Commissioner Nord’s arguments, and my arguments, remain entirely unanswered. The business losses from the implementation of the CPSIA will make February 10 a dark day in American economic history. I have no idea how many business closings will result or when they will happen, and have no interest in promoting that sort of speculation. It is, however, NO speculation that business losses will be severe and entirely the responsibility of Congress during a time of severe financial and economic crisis. House and Senate leadership made certain that businesses will be hobbled, crushing the employees, customers and communities of the affected companies. The gloating self-satisfaction of supporters of this bill (see, e.g., http://www.nrdc.org/media/2009/090205a.asp) will soon backfire as the American public comes to recognize the carnage done by “do-gooders”. As before, I assert that this law will touch an estimated 60% of the U.S. economy in one way or another. The economic impact of the CPSIA making will become manifest over time, not with a Big Bang on February 10 but slowly building and revealing itself long after the damage is irreversible. Those who arrogantly dismissed the protests of the MANY responsible and law-abiding people subject to this unfair law as “misguided” or “misinformed” will be held to account when the wreckage becomes clear. As you vote this week to print up a quick $800 billion to resurrect the economy, please remember to take ownership of your simultaneous action to destroy an important part of it. You have brought this disaster on your voters, and we will remember how you responded to our pleas. I hope you will finally listen to the substantive and legitimate criticism of this disastrous law and use this last opportunity to stay the effectiveness of the CPSIA, thus allowing more time for hearings, further debate and rulemaking, and a rational, fair and orderly implementation of your groundbreaking safety program. There are two business days to go – the time to act is NOW. Per our conversation today, I am writing you to express my deep concern over the dire financial consequences of your office's September 12th legal opinion ("September 12th Opinion") that the new safety standards of the CPSIA apply retroactively to existing inventory. It is unfortunate that so many people misread the issue of "financial consequences" to refer simply to the cost of the inventory. Yes, as covered in detail in today's panel discussion, companies in the chain of commerce (manufacturers, distributors and retailers) have little practical ability to make existing inventory "go away". In that sense, the retroactive application of the CPSIA is in fact disastrous. Yet, the implications of the September 12th Opinion are far deeper and more threatening. A necessary result of the purported retroactive effect of the CPSIA on existing inventory will be (a) widespread defaults under loan agreements as of February 10, 2009, (b) widespread failures to obtain audited financial statements for 2008 (another loan default issue), and (c) for public companies, an immediate Sarbanes-Oxley disclosure issue stemming from these problems. Defaults under loan agreements may result in the reduction or termination of available credit to operating companies. It can also trigger cross-defaults among related entities or related agreements, causing even more far-flung financial destruction. For many family businesses, this could result in a total wipeout of all family wealth in one fell swoop. While these financial consequences have received little attention to date, their potentially highly toxic effect should not be ignored. Loan Defaults: The typical American company finances its operations with asset-based loans. In this kind of loan, lenders agree to advance a percentage of "Eligible Inventory" as a revolving loan. In other words, the loan floats up and down over its term as the borrower meets its daily cash needs, but overall availability is limited by the value of inventory. The size of borrowing availability is determined each month based on representations called "Borrowing Base Certificates" in which the borrower attests to the value of its inventory, and then makes various representations relating to the definition of "Eligible Inventory". I have attached a typical definition of "Eligible Inventory" for your review. Please note subparts (b) and (e), as well as the final paragraph. Subparts (b) and (e) cannot be attested to after February 9, and under the terms of the last paragraph of the definition of "Eligible Inventory", an undetermined amount of inventory would no longer be "eligible". In addition, the ongoing representation of the typical borrower that they are operating in compliance with law can no longer be made. This has implications for the Borrowing Base Certificate, see below. "Pursuant to the terms of that certain [Loan Agreement], we submit this Borrowing Base Certificate to you and certify that the information set forth below and on any attachments to this Certificate is true, correct and complete as of the date of this Certificate. . . . The undersigned hereby certifies that the above information and computations are true and accurate and hereby represents and warrants that as of the date hereof, (i) no Event of Default or Unmatured Event of Default under the Credit Agreement has occurred or is continuing, (ii) the representations and warranties of the Borrower set forth in the Credit Agreement are true and correct in all material respects as of the date hereof, and (iii) the Borrower is in compliance with the covenants set forth in the Loan Agreement." Any Borrowing Base Certificate with such language after February 9 may not be executed by anyone intent on selling or placing a positive value on inventory existing on February 9. An inability to sign a Borrowing Base Certificate or signing a Borrowing Base Certificate with fraudulent intent is clearly a serious default under any loan agreement. Consequences of Loan Defaults: Even a technical default must be resolved between borrower and lender. In this case, lenders will have three basic options for action: (a) levy fees to cure or waive the default (this is a typical provision in many loan agreements), (b) insist that the loan agreement be renegotiated, likely to reduce borrowing availablility based on a new, lower advance rate on Eligible Inventory, and/or (c) an outright and possibly immediate refusal to lend. Notably, if existing inventory continually becomes contraband under the September 12th Opinion as lead and lead-in-paint standards ratchet down over time, this cascade of defaults will repeat again and again. It can be anticipated that many companies will find credit declining or terminated as a result of these defaults. This will have a dramatic effect on these companies' investable capital and their ability to maintain a stable workforce. Audited Statements: Many loan agreements require audited financial statements at the end of every year. All public companies provide audited statements. In preparing audited statements, independent accountants will insist on "testing" inventory valuations. Furthermore, they will take into account events occurring after the close of the period, as such events could expose misleading information in the financial statements for the current period. In the case of retroactive effect on existing inventory, the pending change in valuation of inventory as of February 10, 2009 will make it impossible to certify 2008 financials without serious and negative qualifications (if at all). This failure would have an immediate effect on any company under its loan agreement (and in the public markets, if applicable), resulting in reduction or termination of available credit. Recent events on Wall Street demonstrate the serious threat posed by sudden losses of available credit, and the consequential financial destruction and loss of jobs. Sarbanes-Oxley: The financial implications above clearly constitute a material financial event and create immediate issues under Sarbanes-Oxley for any public company. The fact that this issue has not yet been disclosed by any public company is troubling and potentially creates personal liability for many public company officers, including possible criminal liability. The conclusion that the CPSIA applies retroactively to inventory is an inherently technical legal matter, involving detailed analysis of unbending rules of law. It should be no surprise then that equally technical financial issues emerge in its wake based on precise readings of unbending contracts and GAAP rules. In this case, the above financial/contractual issues are real and will get the attention of the financial community. Lenders have no incentive to be "understanding" in their appreciation of the CPSIA or its good intentions. Good intentions don't repay loans, and contraband inventory makes for poor collateral. And once lenders are provided with an incentive to act (to preserve their own capital), the dominoes will start to topple - ending where? ending how? The CPSC needs to reconsider its opinion urgently and to render a clean, clear and well-publicized opinion that the CPSIA does NOT apply retroactively to existing inventory. Time is of the essence. Thank you for considering my view on this important topic.